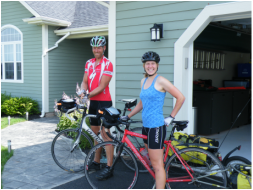 Bicycle Ontario's scenic peninsulas along the shores of four great lakes with route maps showing loop routes and long distance linear routes on bicycle friendly paved secondary roads or trails. Go to Destinations to learn more about more than 400 places on routes in the atlas - where to go, what to see and where to stay. This updates all of the information in the atlas "Community Index" on the sights, experiences, tastes, accommodation and camping in "Community Index". The most recent 2016 Seventh Edition has additional paved road or bike trail routes added on over thirty five percent of the maps. The atlas has 125 pages with 92 pages of maps 1:250 000 scale, 1 page for Northern Ontario. You can bicycle across Southern Ontario with several routes connecting to all Quebec and USA border crossings. ​Cycle with exclusive GPS mapped routes in Ontario's most scenic and popular cycling areas with turn by turn directions and complete area information. Reservations as you require for accommodation, bicycle rental, luggage transfers and travel insurance are now included. The cost of these services is additional. You can ride as soon as you wish with the Ride With GPS digital file delivery. A full colour printed version can be mailed to you. ​Let us take care of all of the planning hassles so you can bicycle in Ontario where and when you want - tailor made for you. .
A route is developed just for you with a gps mapped route and turn by turn route guide for the desired distance with accommodation of your choice at the end of your daily ride - designed exclusively for your desired location and chosen dates. We provide information on attractions, restaurants, bike repair shops, camping and sources for local tourist information. Reservations as you require for accommodation, bicycle rental, luggage transfers and travel insurance are now included. The cost of these services is additional. You can ride as soon as you wish with the Ride With GPS digital file delivery. A full colour printed version will be mailed to you. Accommodation reservations and travel insurance for your Custom Tour or Package Tour are arranged through our partnership with "The Vacation Guy" affiliated with Nexion Canada.